The Cup of the World ***SIGNED*** by John Dickinson: David Fickling Books, Oxford, UK 9780385605168 Hard Cover, 1st British Edition, 1st Printing., Signed By the Author on the Half Title Page - William Ross, Jr. 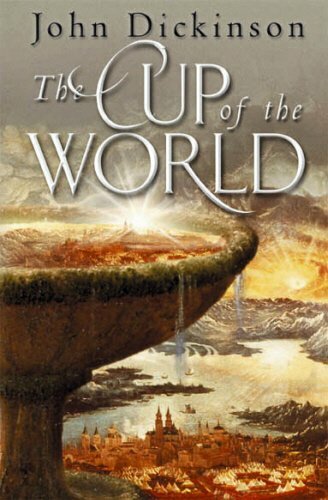 The Cup of the World and its sequels follow a young woman, Phaedra, and subsequently her son, Ambrose, as they come to understand the forces of sin and retribution that have afflicted a small medieval kingdom since its founding. The writing style of The Cup of the World was described by Jan Mark in The Guardian as "detailed, glowing rich, and unforgettable." Amanda Craig wrote in The Times that The Cup of the World and The Widow and the King were "The strangest novels I've come across since William Morris's fairytales." FILLED WITH IMMENSE characters, this thrilling medieval fantasy filled with moral complexity and vision announces the arrival of a special new writing talent.<br /><br />Phaedra, the beautiful daughter of a baron, has been visited in dreams by an elusive knight for almost as long as she can remember. And when his presence becomes a reality, she is forced to choose him and a new life over her home and her father. But this sets off a chain of events that she could not have foreseen--a battle between good and evil, which is in turn violent and psychologically compelling. This stunning novel grapples with the huge themes of life, and turns the reader's expectations upside down again and again, with one vertiginious plunge after another.